Who was that woman lying there? What building is that, now crumbling? Whose side were they on? These are images to be poured over. These are images to be asked questions to, decades later. 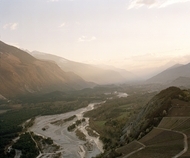 Excerpted below are a selection of images from Koen Wessing: Chili, September 1973, Eratta Editions’ Books on Books No. 8. 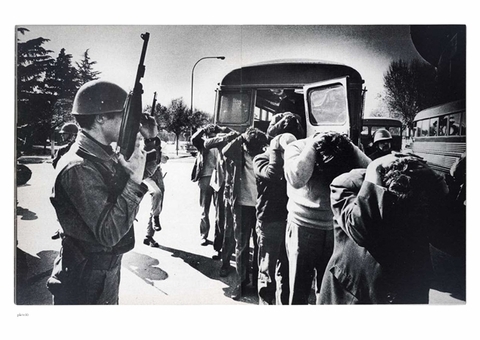 First published in 1973, just months after the fall of Salvador Allende to Augusto Pinochet's coup d'etat, it describes the tense days of the military attempt to root out public opposition in the streets of Santiago, and has since become one of documentary photography's most exemplary moments. 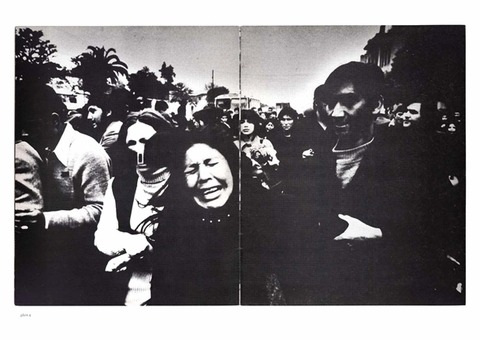 This entry in Errata Editions' Books on Books series reproduces every spread from Wessing's gritty documentation of Chile's darkest historical moment. Below are a number of the original spreads, alongside excerpts from contemporary Dutch journalist Pauline Terreehorst’s text, The Man in the Grey Suit, also from the book. Although the American magazine Life had shown that it was possible to change the balance and give priority to photography, usually photographs still accompanied texts, certainly in newspapers and magazines. Texts were mandatory. Even in photography books, it was still customary to publish texts next to the photographs, often written by famous writers. It was thought to enhance the impression, and reputation, of the photographic work. 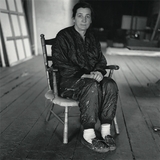 Walker Evans was and still is a great example. But Wessing had experienced that those texts often got more attention than the photographic work itself. Therefore he knew exactly what he did not want, when traveling back with a bag full of films: he wanted to tell his own story. He wanted to use the images as if he was a cinematographer. What he made in Chile was a film, inspired by the Nouvelle Vague of Godard and others in the fifties and sixties, and the work of William Klein. 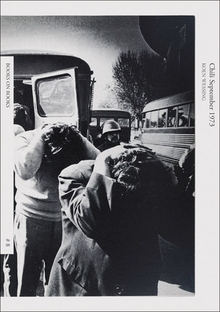 It is a paradox that this reprint of Chili 1973 will be accompanied by a text again, because it lacks the urgency, the historical setting and the context of a knowing audience. Immediately after he returned to the Netherlands, the photographs were printed. 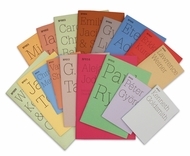 He glued them together in a dummy of the future book and phoned Lubberhuizen, the director-editor of the Bezige Bij. 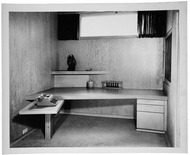 Lubberhuizen had already noticed the impact of Wessings’ photographs in the magazines and acted immediately. 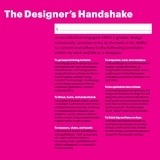 He published the book exactly in the unobtrusive way Wessing had asked for, and for a very low price. In Wessing’s mind it was the only way to get the message spread as soon as possible. What is the story Wessing wanted to get across the thick layer of indifference of an already image-savvy audience? Firstly he wanted them to look. 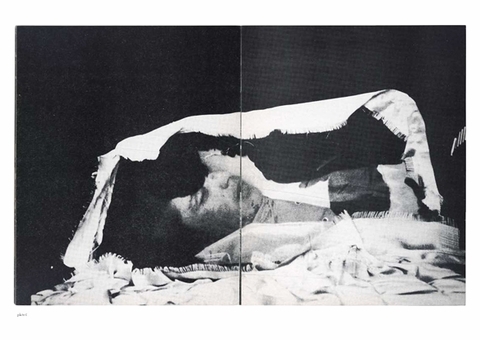 The second reason for not adding texts to rescue the indifferent reader was to force them to combine the photographs himself, to grasp the meaning of the images he was confronted with. Wessing wanted a photo essay, with only images – as if he was a mime-player again, which he used to be for a short period of time at the beginning of his career. The expression of the images had to speak without words. It is in many ways symbolic then that the book starts with a close up of a scarred magazine, almost disappearing in the flames on top of a heap of already burnt books. Incidentally they happened to be the books of a friend, whose apartment was searched by passing soldiers, but this fact he learned only after having returned in the Netherlands. 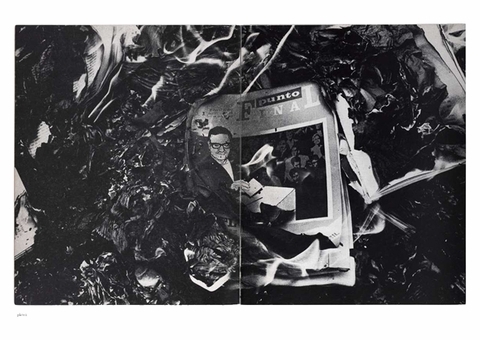 On the cover of the magazine we see a drawing of Allende, by then already assassinated by the military regime. On the next page we see the whole picture: laughing soldiers who throw papers and books on the pile. Burning books is a horrible sign of repression. Regimes who hunt for ideas, for intellectuals, belong to the most severe, the most uncompromising, because they show not to be interested in reasonable thoughts. They want to act without thinking. It always leads to bloodshed. This is what these first images tell us. In the next two pages we see people mourning. They bury loved ones, slain in the first uprising. But in a way they also bury Salvador Allende, although nobody will admit this because it is already forbidden to speak about him. In the next images we see a corpse in a coffin, and again people crying. But the crying is soon replaced by anger. In the double spread that follows we see an image of a left wing demonstration, as can be seen at the many folded fists. But neither cries nor anger can prevent that people are detained, as is obvious in the following pictures. They must have been put on a list, because the whole action takes place with unbelievable efficiency and order. One prisoner after the other passes the grilled fence of the soccer stadium of Santiago. Mostly men. Wives, children and other relatives are left behind, crying, full of anxiety about things to come. It is through this fence that Wessing is able to get in as a photographer. His grey suit must have made him acceptable for the soldiers. He moves around quietly, observing, taking pictures of all the elements of ongoing tragedy. He notices the arrival of the prisoners, heads low, folded hands over their neck, anonymous. Then he shows the gate, where people are waiting. In the next picture we clearly see a detained intellectual. His black hair touches his shoulders. He wears thick black glasses, like Allende did. His jacket is already dirty and he wears no tie. He looks worried, carrying a plaid, as if he is going to a strange picknick. This is one of the most striking images Wessing has taken. He must have known that here he touches the hearts and minds of the people who would leaf through the book, back in Europe: ‘this could have been me’, they must think. Identification is the starting point for action. In the next image we see prisoners being photographed holding a sign with a number – their administrative number as a prisoner. The next step is the lining up of the prisoners, taking them to improvised cellblocks. They walk through a door. From a distance, Wessing sees how the long hair of the men is being cut by professional barbers. Now the anonymisation is almost completed. The nobodies disappear in the stadium, behind another fence. When Wessing throws some cigarettes, they have to fight for it with a soldier, who is interested too. In the meantime, on the next page, a man is brought in who has the appearance of a union man: no glasses, sturdy, hand-knitted sweater. These were the prisoners of the Junta: the left wing union officials, and the left wing intellectuals. All had been said. Time to go – Wessing manages to get out of the stadium. The following days he wanders through the deserted streets of Santiago and sees peculiar scenes. People are being searched, but it is not clear what the soldiers are looking for. It seems like they want to create a sphere of anxiety with their actions. Women have to open their bags. Are they afraid of small guns, while they themselves are carrying automatic weapons the size of a suitcase? These are pointed at windows, where book-loving people may live. Strings of bullets are worn like jewelry. An old woman with shiny black shoes tries to pass unnoticed. Her handbag is no target. In the deserted streets sometimes only prisoners are seen, forced to clean fences that were carrying slogans in favor of Allende. Again words are to blame. The soldiers guarding the scene look at Wessing, in the lens of his camera. One of them is wearing sunglasses: the armed force is anonymous too. Wessing shows us the pile of books again, now turned into ashes. The words are gone. It is the last page of the book, meaningful. Ideas are more alive than ever. Wessing managed to get his message come through. 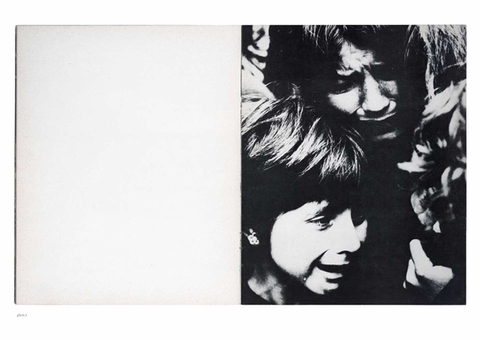 Not only then, in the aftermath of the happenings in Chile, but also later, while photographing in El Salvador and Nicaragua in the early eighties. Those pictures are the ones that were seen by Roland Barthes, the French intellectual and semiotic, who at that time already had written many books and articles about cultural phenomena that can be read as a text. Barthes introduced the elements punctum and studium in his analysis, stating that any striking picture has ‘punctum’ and all the others are merely illustrations, and offer information with ‘studium’. In a way this was what Wessing had expressly wanted with his photography: that they speak for themselves. 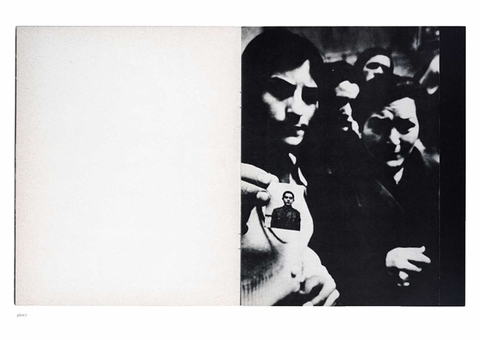 Text excerpts and images excerpted from Koen Wessing: Chili, September 1973. Clth, 7 x 9.5 in. / 64 pgs / 15 color / 30 duotone.